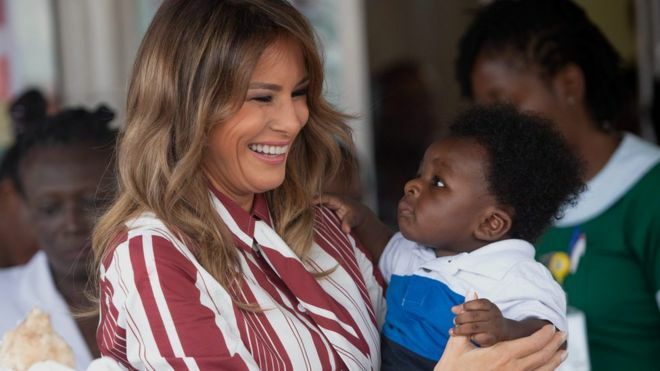 First Lady Melania Trump started Tuesday her first African tour by a visit to Ghana. The First Lady will also visit Malawi, Kenya and Egypt, to promote her ‘Be Best’ campaign, which she launched in May 2018. In Ghana, the first lady visited the Greater Accra Regional Hospital, where she saw babies being weighed as part of a project aimed at promoting nutrition in children, which is supported by funding from the USAID. She offered the kids blankets and teddy bears donated by the White House. According to the White House, Melania’s solo trip will focus on maternal and new-born care in hospitals, education for children, the deep culture and history woven into each African country, and how the United States is supporting these countries on their journey to self-reliance. The 48-year-old First Lady’s visit is expected to be one of the defining moments where Ghana would showcase its rich cultural heritage and deep-rooted history to the world. President Donald Trump has not visited Africa since taking office in 2017, and his comments that immigrants from Africa came from “shithole countries” are still in memories. Posted by Emmanuel Agbenonwossi on October 3, 2018. Filed under News. You can follow any responses to this entry through the RSS 2.0. Both comments and pings are currently closed.